Justin Shapiro, regional sales manager at Thinksign. This unabridged article spotlights one of our selected Young Sign Makers of 2019, Justin Shapiro, and begins with a brief bio before moving into their views of the industry. 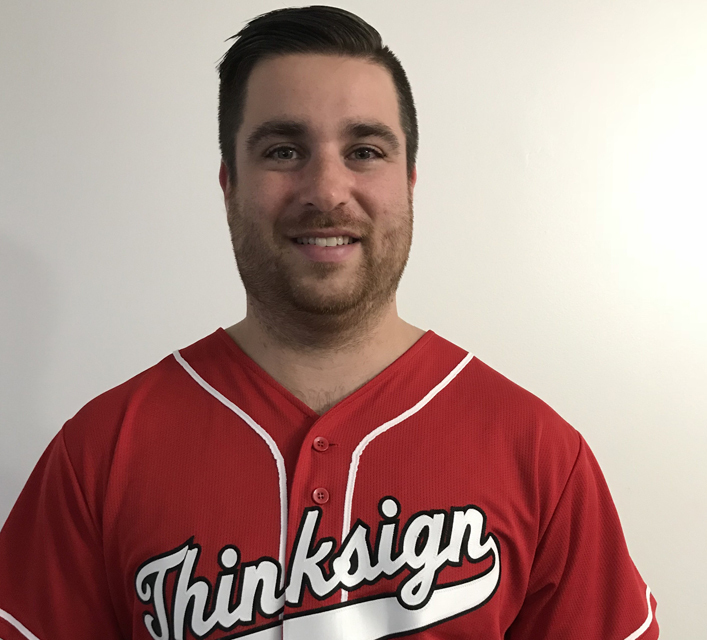 Justin Shapiro has worked for ThinkSign, a designer and manufacturer of on-premise LED electronic message center signs, for a year-and-a-half now and is currently their regional sales manager. 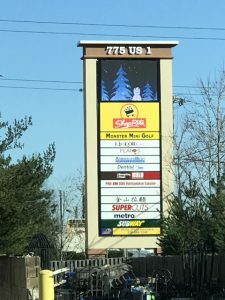 His favorite project this past year was for a double-face, 5-by-8, 10mm, SMD Electric Message Center in a general shopping center in Edison, New Jersey. He is especially proud that he was able to create a partnership with Valle Signs & Awnings in Copiague, New York, to help win that project. Justin also credits his involvement with the Northeast States Sign Association (NSSA) Elite Program for helping him make connections with like-minded sign industry professionals and learn about the other sides of the sign industry outside of EMCs. I have learned so much from the sign industry. There is always a solution to a signage need. 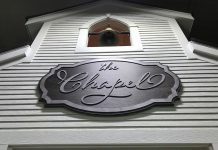 It was an eye-opener when I first started seeing the capability of what a sign company can do. They say that once you are in the sign industry it is hard to get out, and I can see why. The business opportunities are endless, and the individuals who work in the space are some of the greatest people. It is not a stuffy industry with people who walk around in an uptight environment all day—everyone is down to earth and just wants to help out a client with their product. This is a great career for anyone who doesn’t want to sit behind a desk in a nine-to-five corporate America job but is still looking for a career with endless growth opportunities to consider. The sign industry combines my passion of socialization, building relationships, and closing deals. Advertising is one of the most important industries, and every business has a need for it. Helping customers get their messages across to their audience in a professional, memorable way using our products so that their own client bases continue to grow is a fulfilling feeling. 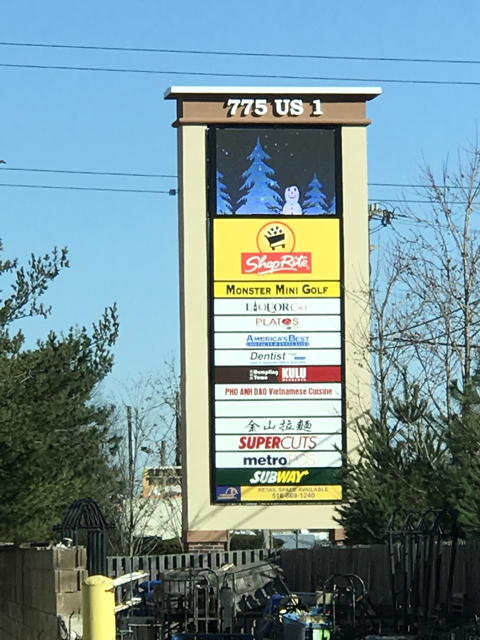 Double-face, 5-by-8, 10mm SMD Electric Message Center at a general shopping center in Edison, New Jersey. When it comes to the people who I get to sell to, they are even better. So many of them work at these “mom and pop” shops that have been passed down as family businesses from generation to generation – they are proud of what they produce and want to make sure that their clients get only the best. Getting the opportunity to show ThinkSign products to large companies who have had lasting relationships with specific EMC vendors for years is the biggest challenge of my job. I wholeheartedly believe that our products speak for themselves, but some companies have loyalty to organizations whose products they have consistently used in the past with no fault. Building strong relationships by being persistent, listening to the prospective clients’ needs, showing how my company’s products can exceed these needs, and consistent follow-ups after the meetings, have helped solve these issues and gotten me in the door. Face-to-face interaction is also the best tactic; don’t take “no” personally or as a final answer! 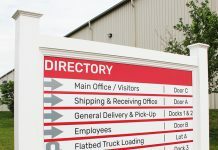 To recruit younger people to join the sign industry, college job fair and targeted career advertisements in magazines and online would be helpful. 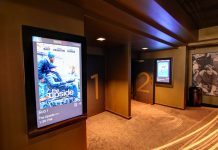 It is important for young people to recognize that every organization in any industry with a brick-and-mortar location has a need for signage—sports complexes, malls, churches, hotels, etc. It is a combination of marketing through sales, business development by building a client book, and creativity when putting together a pitch. The right individual just needs to be a hard worker as well as a consistent businessperson.